The Mt. Rainier Roof Top Tent like the Mt. Hood Roof top tent sleeps 4+ The difference is the 3ft overhang/veranda. This will also like the Mt. 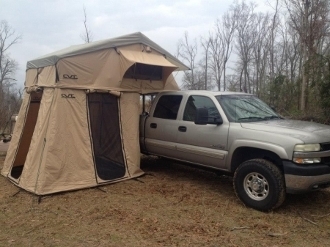 Shasta Roof Top tent give you an extra 3ft in the annex room and being a bigger Car Top tent it will give you more space. Annex/changing room included in price. Size: 72"W x 96"L x 50"Ht. (Open). Size: 72"W x 48"L x 14" Ht. (Closed). Weight: 150lbs - Will hold up to 750 lbs. Base: Aluminum sheets and insulated foam. Ladder: Sliding adjustable aluminum ladder. Fabric: 280g Poly/Cotton Rip Stop Fabric. W/P PU coating, Breathable and Mold Resistant with UV Protection. Rain Fly: 420D Poly/Oxford PU. Mattress: High density foam 2.5" thick. Travel Cover: Heavy duty PVC. If you need a lift gate used to unload your tent at your residence it will cost an extra $50.00 and will be applied to your charge. Alaska, Hawaii and Puerto Rico are not included in the these shipping prices. Please call for a quote.